Stew implies a hearty, high-calorie dish, but that doesn’t have to be true—especially when you cook with chicken, a relatively lean meat. Here are tips for building an extra delicious, even healthier chicken stew. Chicken skin is delicious, but if you’re trying to trim calories, skip it. In a stew, the skin becomes flabby anyway, so you’re not sacrificing much—especially when you add full-flavored ingredients, like the olives in this Provençal chicken stew. 2. Make vegetables the star. Sometimes, carrots and onions that are added to stews are a bit of an afterthought, or even worse, strained out. To up the vitamin quotient and fiber of your stew, add as much chopped vegetables as chicken. Harder root vegetables will take longer to cook and should be added toward the beginning, while your quick-cooking veggies, like asparagus, only need a few minutes and can be thrown in at the end. 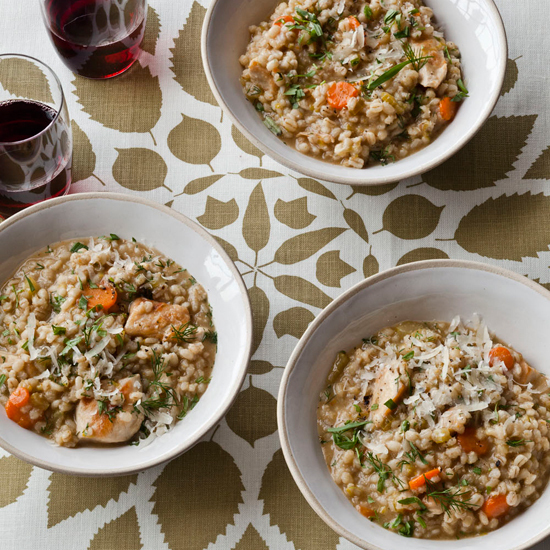 Instead of serving the stew with white rice or noodles, throw in a cup or so of whole grains, like the barley Gail Simmons likes with her comforting chicken stew. 4. Reconsider your cooking liquid. Wine has antioxidants and chicken stock has beneficial minerals with few calories, so the classic choices are already quite healthy. You can also add other nutrients by stewing chicken in other liquids. Tomatoes or tomatillos, for example, add tons of vitamin C. To keep calories down, definitely skip any kind of cream. 5. Give it a spicy kick. Chiles not only have lots of good vitamins, they can boost your metabolism and cause you to eat less. Plus, they add tons of flavor with few calories, so if you like a bit of heat, you can’t go wrong. To amp up the spice, sauté minced fresh chiles with your aromatic vegetables (like onions and garlic), or throw in a few small whole dried chiles to infuse the cooking liquid. You can also use spicy ingredients, like harissa—the North African spice paste—or kimchi—the fermented Korean cabbage—at any point as you cook the stew.